Join the Upstate Native Plant Society on Tuesday, February 19, at 7:00pm as Melanie Rhulman gives us information on “best practices” for both agriculture and the environment. Melanie Rhulman is a water resources specialist and president of Save Our Saluda, SOS, a local nonprofit watershed organization dedicated to the protection and restoration of the Saluda watershed through environmental awareness and citizen action. SOS is working in cooperation with Naturaland Trust and other partners, including the SC Native Plant Society, to create an Agroecosystem Demonstration Site for agricultural best management practices to help control sediment runoff. The site is situated near Slater-Marietta and is leased for crop production. The future extension of the Swamp Rabbit Trail bisects the property, making it an ideal location for a demonstration project. The Upstate Chapter has donated plants and provided volunteers to help create a 1,500-foot riparian buffer of native trees, shrubs, and perennial pollinator plants along Railroad Creek, a tributary to the North Saluda River. Rhulman will give us details of the Agroecosystem Project: why it is important, what has been accomplished so far, and plans for the next phase. Come out and hear about this plan to protect the creek next to agricultural fields that help supply our food chain. We have a NEW venue for this meeting. It will be held at Tri-County Technical College in Pendleton (Anderson County) in Anderson Hall at the Event Center. An area map and driving directions are below. For a detailed campus map, go to https://www.tctc.edu/media/2966/pendleton-campus-map.pdf . Enter campus at the stop light. You CANNOT make an immediate left turn but must drive down a bit, turn around and come back. As you enter the campus, there is parking to the right (student lot) and also visitor parking between Anderson Hall and Hwy 76. Anderson Hall is to the left with the Event Center entrance on the back side of the building (away from Hwy 76). Walk between Miller Hall and Anderson Hall to get behind the building. Please consult/print the detailed campus map. From Anderson: Take Clemson Boulevard to Highway 76/28 toward Pendleton. The college is located on the right at the 6th traffic light from I-85 (approximately 7 miles from I-85). From Greenville: Take 1-85 South toward Atlanta. Take Exit 19-B, US Hwy 76 toward Pendleton/Clemson/Seneca. Follow US 76 approximately 8-9 miles. Tri-County Technical College is on your right. Turn right at the traffic light. From Easley: Take Highway 123 toward Clemson and turn left at the University Inn onto Highway 76. The college is located approximately 3 miles on the left. Turn left at the traffic light. From Seneca: Take Highway 123 toward Clemson. Turn right onto Highway 76. The college is located approximately 3 miles on the left. Turn left at the traffic light. 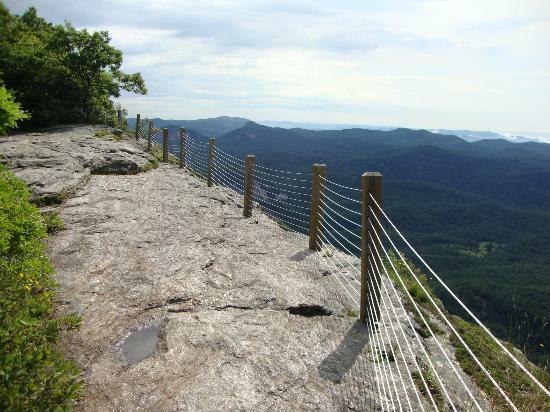 Join the Native Plant Society and trip leader Dan Whitten for an all day outing to Whiteside Mountain in NC followed by a tour of Highlands Biological Station. Dan says, We will hike a two mile loop trail, moderate overall, and also take an easy walk at the Biological Station. Restroom is available at the trail-head. Wear field footwear and clothing, bring lunch, snacks, and water. CARPOOL starts at 8:15am at Holly Springs store (intersection of Hwys 11 and 178). Park behind the store. Store address is 6491 SC 11, Pickens, SC 29671. To register, contact Virginia Meador <vmeador@camperdown.org>. Please indicate the number in your party, whether or not you can drive, and how many passengers you can take. Also, please include your cell number for last minute communications. Upstate Native Plant Sale. Mark your calendar now! The Upstate Chapter of the SC Native Plant Society holds its Spring Native Plant Sale on Saturday, April 21 at Conestee Park, 840 Mauldin Road, Greenville, SC. There is a change in the opening time this year. At 9am, the sale opens for Paid NPS Members Only and at 9:30am for the general public. The sale closes at 1pm. Join SCNPS now to take advantage of the early entry and all the other great programs, field trips, and activities offered by the Upstate Chapter. We will offer a wide variety of native trees, shrubs, perennial wildflowers, vines, ferns, and some grasses. There will be plenty of plants for pollinators. Native plants are adapted to our local climate and soils and provide food and habitat for birds, insects, mammals, and all our local fauna. They also provide beautiful flowers, fruits, form, and color to the landscape. So, plant something for the pollinators this year and make your landscape a welcoming and beautiful space. Cash, checks and credit will be taken. A list of available plants can be downloaded here. List doesn’t include Guest Vendor plants or last minute additions. To volunteer to help with the Sale, click here! To download a flyer (with a map) to share with others, click here! Note: This program will take place at the Wilkins Conference Center at Roper Mountain Science Center in Greenville. This is a new meeting facility for the Upstate Chapter. David White’s passion is protecting rare plants and rare communities and supporting the sustainability of these. “Our presence in those places is important, especially those in challenging conditions,” says David. He sees the effects of vegetation management, including prescribed burns, for less woody, more open habitat. David feels fortunate to be doing the work he does, often at the wildland/urban interface, at boundaries of private property. Listening to White talk about Longleaf Pines and Shortleaf Pines is like hearing a man talk about his friends. His favorite is the Shortleaf Pine (Pinus echinata), which he affectionately refers to as his “totem”. David describes it as a “stately, beautiful tree” which he considers a keystone species of primarily the Piedmont and lower Blue Ridge. David’s career has led to a variety of projects and publications. His work has included: Roan Mountain Grassy Bald Restoration in Pisgah National Forest, Southern Pine Beetle Prevention-Thinning and Longleaf Pine Restoration in Uwharrie and Croatan National Forests, monitoring change in Southern Appalachian populations of Ramps (Allium ricoccum), the land use history of the Savannah River Site, and prescribed fire for ecological restoration in Linville Gorge Wilderness and Carolina Sandhills National Wildlife Refuge. • assessing integrity of Longleaf Pine ecosystems in Francis Marion National Forest. At his presentation on March 20, David will be talking about these and other recent projects. David White has deep roots in the Carolina Piedmont. He grew up in Easley during the years that environmental concern in our country was also growing. As a Biology major at Wofford College in the 1970s, he was inspired by Dr. Gibbes Patton. David briefly considered medicine as a career, following his own father and the path of many Biology majors at Wofford, but plants called him to pursue graduate work in Plant Ecology at the University of Georgia. Today David lives on family land in Pickens, returned to forest after recovering from farming for cotton and corn. Join the Upstate Native Plant Society’s January meeting as botanist and naturalist David Campbell shares his survey of the rare and unusual plants of Polk County. Polk County lies just on the other side of the North Carolina line, centered over the counties of Greenville and Spartanburg. It is home to the towns of Saluda, Columbus, and Tryon, to the wildflower preserve known as Pearson’s Falls and Glen, and to an impressive array of mountains and a swath of rolling foothills. Botanist David Campbell has been cataloging the plant life of Polk County on behalf of the herbarium at the University of North Carolina at Charlotte since about 2012. Why Polk County? “It’s a neat county because it goes from the piedmont to the mountains,” he said. “There’s a lot of geological diversity, the soils are very unusual, very nutrient-rich, so there’s some neat things to be found there.” Neat things to be found, but over fifty years since any significant body of field research had been done! Part of the county is located within the Southern Blue Ridge Escarpment, where the Blue Ridge Mountains abruptly rise from the rolling piedmont, an area that contains some of the highest natural diversity of rare plants and animals found anywhere in the world. Polk County is also widely known for its unusual “thermal belt” — a zone within mountains or foothills with a milder climate and longer growing season than elevations either higher or lower. Polk’s interesting plant life includes oddball “disjuncts” that are more than 500 miles away from where they are normally found, and it is said to hold the only North Carolina occurrences of plants such as the Allegheny spurge (Pachysandra procumbens), whorled horsebalm (Collinsonia verticillata), Ozark bunchflower (Veratrum woodii), and thicket creeper (Parthenocissus inserta). Polk also supports plant communities such as you might expect to see along the Carolina Coast. In the hills south of Columbus, Campbell discovered a population of 200 sweetbay magnolia trees (Magnolia virginiana), something more often found in Coastal Plain pocosins, swamps and seeps. David Campbell has worked for Habitat Assessment and Restoration Professionals(HARP), based in Charlotte, since 2003,and he has over 25 years of experience as an Ecologist and Botanist studying the biota of North America, the United Kingdom, and areas of the Neotropics. David has particular expertise in conducting surveys for rare and threatened species throughout the southeastern United States. While the meeting starts at 7pm, please arrive at 6:30 to enjoy refreshments and socializing. Start 2018 with your friends from NPS! The July meeting of the Upstate NPS chapter features Keith Bradley who will give us a look at the rare and unusual native plants of the other end of the state, the Low Country. Bradley was recently asked by the U.S. Fish and Wildlife Services to survey and map the rare plants of the national wildlife refuges in the low country, including the Lewis Ocean Bay Heritage Preserve in Horry County, South Carolina. In his talk, Bradley will highlight some of the unusual species he discovered during his survey. He hopes those attending the meeting will enjoy learning about some of the unique plants he has discovered in the wildlife refuges. He is especially passionate about the rare plants that aren’t usually given much attention. Some plants, such as the dwarf spring lily (or pygmy spider lily), are “under the radar in the conservation community,” according to Keith. Keith Bradley has been a research botanist for over 25 years, with expertise in plant taxonomy and conservation, and has authored southeastern US plant identification guides. The meeting is at Landrum Depot, 211 North Trade, Landrum, SC, starting at 7pm. Arrive at 6:30 for refreshments and socializing before the meeting. The meeting is free and open to the public. 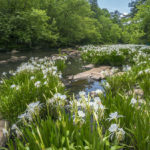 There is a huge interest in our Rocky Shoals Spider Lily site at Parks Mill on Stevens Creek in McCormick County. We have had so many groups ask about coming that we are scheduling two Open House Saturdays, May 13th & May 20th, beginning at 11:00am. The purpose of these events is to familiarize people in the region with this beautiful historic site. We want to share our vision for its future, and to enlist the support and assistance of all Native Plant Society folks and other groups in carrying out this preservation mission. By working to inspire folks to embrace this wonderful resource with the same passion and intent as we do, we’re hoping to capture the spirit of a “Friends of the Park’s Mill Lilies” group. You are invited to join with us at the site at 11:00 on May 13 or May 20. We will discuss the botany of this wonderful rare plant, and its history, as well as the history of the Mill Site. We will discuss the history of how it came to be protected. We will discuss our management plans for the site, and hopefully motivate visitors to appreciate the site as much as we do. Then we will guide groups around the site to examine the lilies (they should be at peak of bloom), and to discuss the history and workings of the grist mill. We are planning for the event to last no more than two hours. Bring your own lunch and drink if you wish to enjoy a picnic on site, and we will have a bathroom facility (one) available. All persons interested in attending the Open House, please register by emailing Virginia Meador at <virginia_meador@hotmail.com>. Include a cell phone number for last minute information. Parking on the site is very limited, so we suggest that groups should van-pool to assure that we have adequate parking space. If you plan to travel in cars, we ask that you park in downtown Plum Branch and ride a van shuttle to the site. Call 864 979 3169 for a shuttle. Once there it’s a short walk on nearly level ground to the lilies. If you are planning on bringing a group,please provide us with number of people in your group. We ask that one individual in your group take responsibility for making arrangements on behalf of your group and serve as our contact person. We will ask that each person sign a waiver of liability holding SCNPS and Naturaland Trust blameless in case of accidental injury. If you are planning on bringing a group, please provide us with number of people in your group. We ask that one individual in your group take responsibility for making arrangements on behalf of your group and serve as our contact person. We will ask that each person sign a waiver of liability holding SCNPS and Naturaland Trust blameless in case of accidental injury.